They increasingly dot the planet. There's a facility outside Las Vegas where "pilots" work in climate-controlled trailers, another at a dusty camp in Africa formerly used by the French Foreign Legion, a third at a big air base in Afghanistan where Air Force personnel sit in front of multiple computer screens, and a fourth at an air base in the United Arab Emirates that almost no one talks about. Run by the military, the Central Intelligence Agency, and their proxies, these bases -- some little more than desolate airstrips, others sophisticated command and control centers filled with computer screens and high-tech electronic equipment -- are the backbone of a new American robotic way of war. They are also the latest development in a long-evolving saga of American power projection abroad -- in this case, remote-controlled strikes anywhere on the planet with a minimal foreign "footprint" and little accountability. Post journalists Greg Miller and Craig Whitlock reported that the "Obama administration is assembling a constellation of secret drone bases for counterterrorism operations in the Horn of Africa and the Arabian Peninsula as part of a newly aggressive campaign to attack al-Qaeda affiliates in Somalia and Yemen." Within days, the Post also reported that a drone from the new CIA base in that unidentified Middle Eastern country had carried out the assassination of radical al-Qaeda preacher and American citizen Anwar al-Awlaki in Yemen. With the killing of al-Awlaki, the Obama Administration has expanded its armed drone campaign to no fewer than six countries, though the CIA, which killed al-Awlaki, refuses to officially acknowledge its drone assassination program. The Air Force is less coy about its drone operations, yet there are many aspects of those, too, that remain in the shadows. Air Force spokesman Lieutenant Colonel John Haynes recently told TomDispatch that, "for operational security reasons, we do not discuss worldwide operating locations of Remotely Piloted Aircraft, to include numbers of locations around the world." Still, those 60 military and CIA bases worldwide, directly connected to the drone program, tell us much about America's war-making future. From command and control and piloting to maintenance and arming, these facilities perform key functions that allow drone campaigns to continue expanding, as they have for more than a decade. Other bases are already under construction or in the planning stages. When presented with our list of Air Force sites within America's galaxy of drone bases, Lieutenant Colonel Haynes responded, "I have nothing further to add to what I've already said." News reports have frequently focused on Creech Air Force Base outside Las Vegas as ground zero in America's military drone campaign. Sitting in darkened, air-conditioned rooms 7,500 miles from Afghanistan, drone pilots dressed in flight suits remotely control MQ-9 Reapers and their progenitors, the less heavily-armed MQ-1 Predators. Beside them, sensor operators manipulate the TV camera, infrared camera, and other high-tech sensors on board the plane. Their faces are lit up by digital displays showing video feeds from the battle zone. By squeezing a trigger on a joystick, one of those Air Force "pilots" can loose a Hellfire missile on a person half a world away. Meanwhile, at Langley Air Force Base in Virginia, according to a report by the New York Times, teams of camouflage-clad Air Force analysts sit in a secret intelligence and surveillance installation monitoring cell-phone intercepts, high-altitude photographs, and most notably, multiple screens of streaming live video from drones in Afghanistan. They call it "Death TV" and are constantly instant-messaging with and talking to commanders on the ground in order to supply them with real-time intelligence on enemy troop movements. Air Force analysts also closely monitor the battlefield from Air Force Special Operations Command in Florida and a facility in Terre Haute, Indiana. CIA drone operators also reportedly pilot their aircraft from the Agency's nearby Langley, Virginia headquarters. It was from here that analysts apparently watched footage of Osama bin Laden's compound in Pakistan, for example, thanks to video sent back by the RQ-170 Sentinel, an advanced drone nicknamed the "Beast of Kandahar." According to Air Force documents, the Sentinel is flown from both Creech Air Force Base and Tonopah Test Range in Nevada. Other bases have been intimately involved in training drone operators, including Randolph Air Force Base in Texas and New Mexico's Kirtland Air Force Base, as is the Army's Fort Huachuca in Arizona, which is home to "the world's largest UAV training center," according to a report by National Defense magazine. There, hundreds of employees of defense giant General Dynamics train military personnel to fly smaller tactical drones like the Hunter and the Shadow. The physical testing of drones goes on at adjoining Libby Army Airfield and "two UAV runways located approximately four miles west of Libby," according to Global Security, an on-line clearinghouse for military information. Additionally, small drone training for the Army is carried out at Fort Benning in Georgia while at Fort Rucker, Alabama -- "the home of Army aviation" -- the Unmanned Aircraft Systems program coordinates doctrine, strategy, and concepts pertaining to UAVs. Recently, Fort Benning also saw the early testing of true robotic drones -- which fly without human guidance or a hand on any joystick. This, wrote the Washington Post, is considered the next step toward a future in which drones will "hunt, identify, and kill the enemy based on calculations made by software, not decisions made by humans." Elsewhere in the Greater Middle East, according to Aviation Week, the military is launching Global Hawks from Al Dhafra Air Base in the United Arab Emirates, piloted by personnel stationed at Naval Air Station Patuxent River in Maryland, to track "shipping traffic in the Persian Gulf, Strait of Hormuz, and Arabian Sea." There are unconfirmed reports that the CIA may be operating drones from the Emirates as well. In the past, other UAVs have apparently been flown from Kuwait's Ali Al Salem Air Base and Al Jaber Air Base, as well as Seeb Air Base in Oman. In the wake of a devastating suicide attack by an al-Qaeda double agent that killed CIA officers and contractors at Forward Operating Base Chapman in Afghanistan's eastern province of Khost in 2009, it came to light that the facility was heavily involved in target selection for drone strikes across the border in Pakistan. The drones themselves, as the Washington Post noted at the time, were "flown from separate bases in Afghanistan and Pakistan." Both the Air Force and the CIA have conducted operations in Pakistani air space, with some missions originating in Afghanistan and others from inside Pakistan. In 2006, images of what appear to be Predator drones stationed at Shamsi Air Base in Pakistan's Balochistan province were found on Google Earth and later published. In 2009, the New York Times reported that operatives from Xe Services, the company formerly known as Blackwater, had taken over the task of arming Predator drones at the CIA's "hidden bases in Pakistan and Afghanistan." Following the May Navy SEAL raid into Pakistan that killed Osama bin Laden, that country's leaders reportedly ordered the United States to leave Shamsi. The Obama administration evidently refused and word leaked out, according to the Washington Post, that the base was actually owned and sublet to the U.S. by the United Arab Emirates, which had built the airfield "as an arrival point for falconry and other hunting expeditions in Pakistan." For some time, rumors have also been circulating about a secret American base in Ethiopia. Recently, a U.S. official revealed to the Washington Post that discussions about a drone base there had been underway for up to four years, "but that plan was delayed because 'the Ethiopians were not all that jazzed.'" Now construction is evidently underway, if not complete. Then, of course, there is that base on the Seychelles in the Indian Ocean. A small fleet of Navy and Air Force drones began operating openly there in 2009 to track pirates in the region's waters. 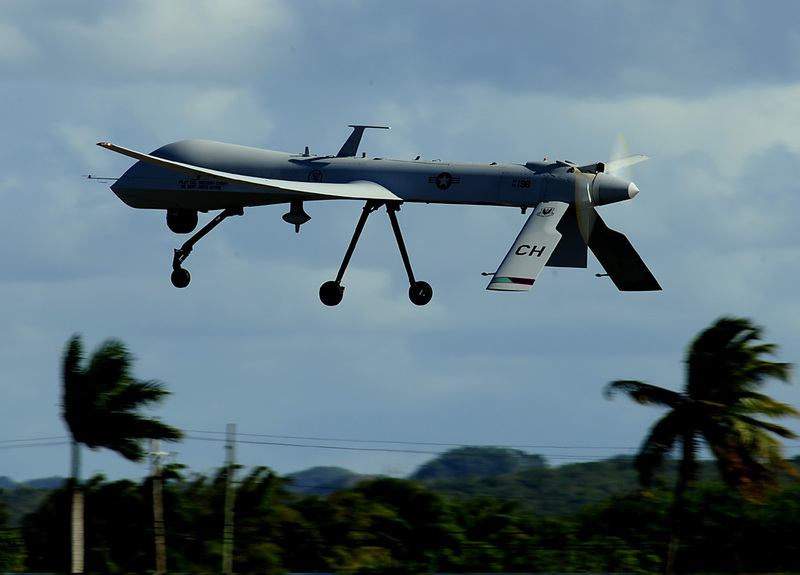 Classified diplomatic cables obtained by Wikileaks, however, reveal that those drones have also secretly been used to carry out missions in Somalia. "Based in a hangar located about a quarter-mile from the main passenger terminal at the airport," the Post reports, the base consists of three or four "Reapers and about 100 U.S. military personnel and contractors, according to the cables." According to a report by the Congressional Budget Office published earlier this year, "the Department of Defense plans to purchase about 730 new medium-sized and large unmanned aircraft systems" over the next decade. In practical terms, this means more drones like the Reaper. Military officials told the Wall Street Journal that the Reaper "can fly 1,150 miles from base, conduct missions, and return home... [T]he time a drone can stay aloft depends on how heavily armed it is." According to a drone operator training document obtained by TomDispatch, at maximum payload, meaning with 3,750 pounds worth of Hellfire missiles and GBU-12 or GBU-30 bombs on board, the Reaper can remain aloft for 16 to 20 hours. Even a glance at a world map tells you that, if the U.S. is to carry out ever more drone strikes across the developing world, it will need more bases for its future UAVs. As an unnamed senior military official pointed out to a Washington Post reporter, speaking of all those new drone bases clustered around the Somali and Yemeni war zones, "If you look at it geographically, it makes sense -- you get out a ruler and draw the distances [drones] can fly and where they take off from." What are the Air Force's plans in this regard? Lieutenant Colonel John Haynes was typically circumspect, saying, "We are constantly evaluating potential operating locations based on evolving mission needs." If the last decade is any indication, those "needs" will only continue to grow. Nick Turse is a historian, essayist, and investigative journalist. The associate editor of TomDispatch.com and a senior editor at Alternet.org, his latest book is The Case for Withdrawal from Afghanistan (Verso Books). This piece originally appeared on TomDispatch. The opinions expressed in this commentary are solely those of the author.